The garage door springs are one of the most important parts of the system and its operation, as well as its most dangerous parts to attempt to repair on your own. That’s why it’s important to contact our technicians at Garage Door Repair Gig Harbor to ensure your springs are working properly. We offer the following services. The springs regulate the speed at which the door moves. 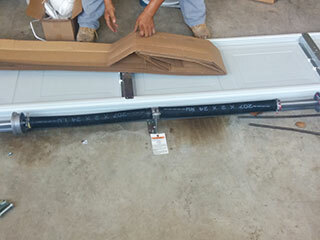 The spring’s torque is a counter-balance to the weight of the door. If your door is slamming shut or closing too quickly, it’s likely that the springs need to be adjusted. It’s important to get this issue checked immediately by a professional, as this can be a major safety issue. It’s imperative that you don’t try to open the door with a broken spring, and you don’t attempt repairs and adjustments on your own. Call our professionals to replace the springs and get your garage door working smoothly and safely. Garage doors can be fitted with two types of springs depending on their weight– torsion or extension springs. Torsion springs are sturdier and last longer, but they are more expensive. There are other factors to consider as well, for example, the length of the spring will determine the weight it can handle. Some doors require one spring and others require two. It’s best to contact our professionals to provide you with the best advice and installation of the ideal type of for your door. Many of the repairs and maintenance also require special tools. Attempting to do the work on your own could result in greater costs in the long run. It’s best to contact our professionals, particularly when dealing with spring maintenance and repair.